The United States is currently battling the biggest heroin epidemic we have seen in decades. Let’s take a look at how this problem came to loom on Americans. During the mid-1800s, opium addiction was a major craze amongst Americans. To combat this issue, opium addicts were provided with a supposedly less potent and nonaddictive drug substitute called morphine. Morphine, as we all know, is not anybody’s friend. It’s a highly addictive and lethal drug, which soon reigned over the lives of Americans in a much bigger way than opium did. Heroin is an even bigger problem now than it was in 2007. PHOTO VIA WIKIMEDIA COMMONS. I wonder what the prescribers were thinking but they introduced heroin to these addicts in hopes they would wean off morphine and move onto something less harmful. Today, the United States is staring in the face of its highest addiction poll because of this drug. Heroin can be smoked, sniffed or injected. Overdose is the biggest and most common threat, especially when people buy this drug off the streets because they are unaware of the strength of the strain and are thus at a constant risk of overdosing. Withdrawal is extremely painful but continued usage leaves the person bony, with a broken down immune system. 1. The drug is available in various forms, is more affordable and is easier to consume, making it more tempting than ever. 2. Abusers are less likely to be caught because of the alternative ways of using this drug. An abuser could look like a regular kid, enjoy the same music and activities as his or her counterparts and have no needle marks to show for it. 3. One of the nation’s busiest border crossing, the San Ysidro Land Port of Entry near San Diego, is where most of the heroin is smuggled into the country from, making it easier to transport it to the various dealers awaiting the shipment around the busy port. 5. Among the bigger reasons is the fueled usage and allowance of prescription drugs, such as Vicodin and OxyContin. However, measures are being taken by putting an upper limit on the dosage amount doctors are now allowed to prescribe. 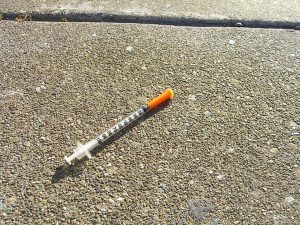 While we can’t do much more than the Drug Enforcement Administration is already doing to curb the rising trafficking, distribution and usage of heroin, we can keep our eyes open to spot it happening around us amongst our friends, neighbors and streets by reporting the problem to the authorities. Let’s keep America safe and bring the heightened average down.